We finally did it! 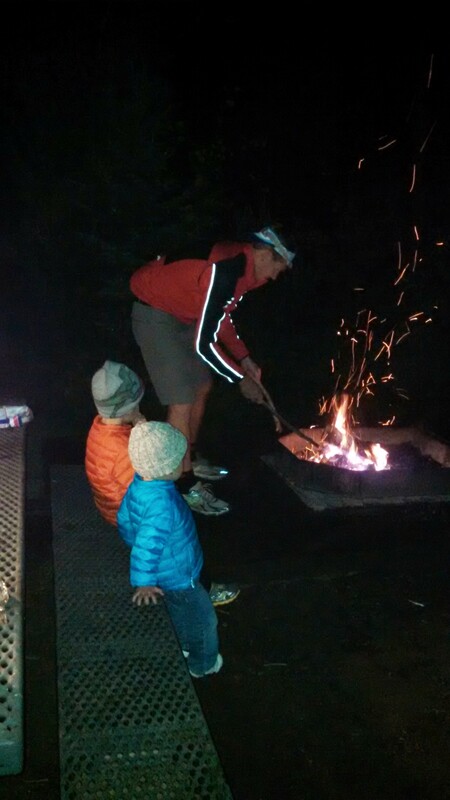 After lots of “should we or shouldn’t we?”, we actually got the kids out camping. I’m calling it a sample because it was only for one night with a very basic itinerary (eat, sleep, play). No grand hiking adventure, only a short distance from home and a strong backup plan of just continuing onto Keystone. Since this is Colorado, campgrounds fill up faster than a mall parking lot so we opted to reserve a spot at a tent-only campground at Golden Gate Canyon State Park to avoid driving around blindly hoping for an open site. The sites here were mostly well-spaced and the rainy weather must have discouraged our nearest neighbor from showing up at all. It definitely discouraged me and to be honest, I was not committed to camping until we actually got to our campsite and confirmed we would not be in a storm or a flooded tent pad. Once we saw how nice our campsite was, we went all in and started unloading the car while the kids explored. As it was already getting late and storm clouds gathering, we hurriedly set up the tent and started the fire for cooking. This part can be as hard or as easy as one would like. One of my fondest recollections of cooking breakfast while camping is preparing a full pound of bacon with a Coleman grill for a dozen people. I’ve made gourmet omelets with last night’s grilled leftovers. I discovered the possibilities of a pie iron involving Nutella. This time I opted for very, very easy. Hot dogs for dinner, marshmallows for dessert, and cereal for breakfast… plus some doughnuts we bought at 7-11 along with our firewood. Done. The sleep plan was by far the one that stressed me out the most. How would they stay warm throughout the night since they both reject the idea of staying under a blanket? What if they cry the whole night and wake our neighbors? What if it rained all night and all my efforts in waterproofing and seam-sealing the tent were useless? And we would be without the comfort and routine which we heavily rely on at home (night lights and sound machines) to induce the perfect sleeping environment. We were prepared for utter misery. As it turned out, we had little to worry about. Bedtime was super late, which I was hoping would compensate for everything else about bedtime being out of sorts. We layered up the kids in two sets of pajamas (a two-piece under flannel footies) and had winter hats at the ready. 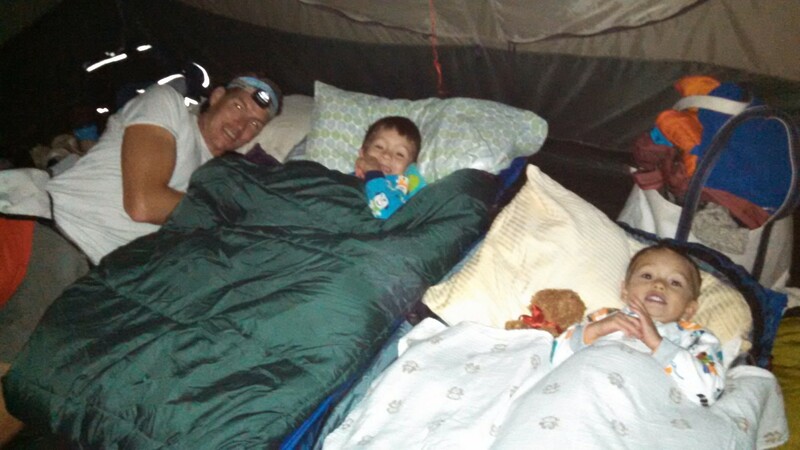 The kids were set up in toddler-sized cots with their regular pillows and our old sleeping bags with the bag excess tucked under their cot. We read a few books to wind down some very excited children. We hung glow sticks around the tent so that it wouldn’t be completely dark. The only incident was Cooper waking up crying around one in the morning where I attempted to shush and console him but he ended up getting right back in his cot after a few minutes, slept peacefully the rest of the night, and was last to wake up in the morning. Sleeping after the sun has risen. A camping miracle! Last one to wake up. I think he likes it here. There was a cavernous tent. There was fire. There was dirt. There were puddles. There were rocks, both big enough to climb and small enough to throw. Done and done. We are calling this an absolute success and I am so ready to do this again. A whole new world has opened up! But next time, I want to get there earlier, stay there longer, and cook some real food over the fire.